If I understand the GCR correctly, it appears the "350" engine is legal in AS with a weight penalty. Is this accurate? It appears you can build a 305 - using either the LG4 or LB9 blocks. Or you can build a 350 - using a common 4.00" bore block and one of the listed 3.48" stroke crankshafts. My car currently has a worn out 305 (LG4 based) engine. I have not weighed it yet. It is a 1989 Camaro. Last run in 2006. It also appears if I have an engine under 313 cubic inches, either a "305" or the above mentioned "302" (assuming this is legal to make) - I must weigh 3280#. If I go with an engine over 313 I must weigh 3580. Spare blocks I have available are a 1974 4.00" bore, and I have a 1991 LB9 (TPI 305). I also have several LO5 blocks (4.00" bore, 1 piece rear main seal). You've asked a LOT of good questions, but, may be looking at an older ruleset. I recommend downloading the current GCR. I'd be happy to talk with you and provide individual answers to your questions if you like. Send me a private message with your phone number and a good day and time to call and I'd be glad to call. Thanks for the reply, I will PM you later when I get a chance. I downloaded the current GCR off the SCCA website and it's coming off as the 2009 GCR. My hard copy of the GCR is from 2008. I am thinking/posting not only for myself, but possibly for the other potential folks who might wish to come and race AS, but won't ask or aren't aware of this class even being a viable option. Apparently this is an area that's also been addressed here & there over the years. I stumbled across a retired/parked AS car after I was trying to build a CMC car for NASA. I also attended a major race there where I was checking into running CMC and the well placed fellow told me they were trying to push everyone from CMC into AI. Then I bought the legal AS car, so I'm back. And it'll cross over to AI. And further, you (SCCA) have a huge potential CMC audience to reach out to. IMO. Try this link and download the April Updated GCR for 2019. Andy Schneidemeyer runs an iron head 305 at 3100# in Midiv. He also ran the Runoffs the last two years. The April 2019 GCR is available to down load. 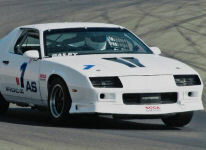 Go the SCCA - Programs - Road Racing and click on the Rules on the right side under Road Racing Home. You will see 2019 General Comp. Rules. click on April updated. I got the 2019 GCR, thanks. If you need any help deciphering the rules, just ask.